In colder climat: before letting the elephants out in the encosure after shower one must to make sure they are completely dry. A good routine to checl this is to put and hand beteen the foreleg and the stomach, this is the last place likely to become dry. Letting elephants out in bad wether will cause joint problem and disturbance of blood flow in the ear venes. Reaumatic problem might appear many years afterwards, when its to late do anything, why it simply must be prevented earlier. 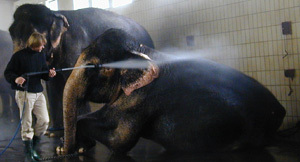 This type of shower can improve the skin and nail condition very positive, and if its introduced in a calm way, and not forced upon the elephants with stress, they will also get used to this type of washing, and not only benefit from it, some will also really like it.